on a separate post with an update made to this one also. All entries received are posted in the slide show below. Thank you to everyone who participated! If your cards aren't pictured they didn't arrive in time I am sorry but I will still take any late arrivals to the nursing home later this week for them for Valentines day! FANTASTIC job everyone - we are making a difference in someone's life! ETA: $15 Gift Certificate from FireCracker Designs by Pamela! WOWZER you can pick whatever stamping stuff you want how cool is that! Also card of thanks from me! 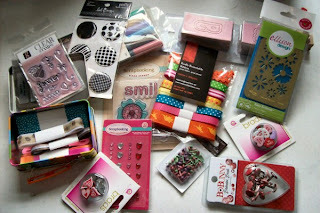 Ribbon from Really Reasonable Ribbon - is in the picture right in the center :) Thanks so much Debbie for the donation! Erin from Stamper Storage has added a gift Certificate for $10 towards any purchase from her store! WooHoo if you win the drawing you will be getting this certificate with your name and a special code to use on it! Thanks Erin for supporting the cause! A friend was over awhile back and telling me about visiting her mom who lives at the Nursing home. She said it was the holidays but it was so dreary in the rooms there and she was wondering what we could do to put a smile on their faces. So we hatched a plan to make some simple but fun cheery cards to share with them. We further decided to get some Valentine chocolates and put one with each card and take them there for Valentines day for the workers to pass out with the dinner trays. A MILLION THANK YOU'S TO EVERYONE WHO TOOK TIME TO SEND SOMETHING - WE REALLY APPRECIATE IT AND YOUR KINDNESS IS WONDERFUL! OK - Am I the first. I love this idea, and as I've just made up some Valentine Cards today, I'll send you a few for this. My Mom used to work in a nursing home, and it broke her heart to see so many people just forgotten. We lived in a small community, and we knew family members were still around, just never around to visit! SHAME! So we always did things mostly at holiday times, but this idea is wonderful! I think I'll try to do this locally too! I've added this to my blog (triesmakingcards.blogspot.com, so count me in! Great idea in reaching out to the others, Karyn!! I love it! Thanks for the chance to win! Unfortunately, I've had two grandparents spend some time in a nursing home. They hated having to go, and both died during their stays. Every time I visited them, it was sad to see so many "forgotten people". The nurses and aides (in these homes) tried so hard to show kindness, but it just wasn't enough. And I know many homes are far less appealing with staff that don't seem to care. I'd be happy to send some cheer your way! I'll also post about your card drive on my blog, The Paper Freak. You've touched my heart, I'll be creating this weekend for you! Also will be making extra to take to the nursing home near me. Nice and easy way to Pay it forward. Thanks for the idea and blog candy offer. Last year I send blank Valentines to the troops for them to send back to their love ones; I realized the other day that I'd forgotten to do it this year. This is a great idea and I will definitely get some cards out to you next week! Ooooh! This is very sweet! I like the idea. I work with elderly patients everyday and TRUST me, they will love this! Such a Sweet, sweet thought! This will made they're day!! Will be working on my card! Thanks for the opportunity to enter in the drawing! hello karyn, I am sending in 2 card for you for this as it sounds great and my 1 grandma was in the nursing home where she died. I know they will love the cards. Plus i have this on my blog so others can see this also. i will get this out in tomorrows mail. What a wonderful idea! I will be sending you several cards. I added you to the Candy Jar in the side bar of my blog. Ok, here's an update of my blog! Made a post about the blog candy you are having plus the details where all the cards will be going! So check out my blog! Hi Karyn nice project! I love my parents and I dont understand why they are mistreated when they get old.I want to draw a smile on their faces with my simple cards.Hope they will like it as I am just a novice crafter.Il post mine this weekend. How fun Karyn!! I'm looking at the cards!! Very cool idea!! :) TFS! Hope you get lots of cards! This is a fab idea. I am sending my card today and I am linking this candy in my side bar right now. What a lovely thought. Quick question--do you want each card to have a blank envelope for them or do you just want the cards??? I think this is a lovely way to show some people that there are people who care. I will get a couple of cards off to you and hope they get there by 6th Feb from England. I have also added your candy to my sidebar with a message to pop over and see you. Hope all goes well with the delivery and thank you for doing this as these are the people that get forgotten from charitable events. Hope you get lots of cards to take to those wonderful people! I have places a big ol' note on my blog about your candy and the cards I have mailed to you will be posting on my blog over the next week. I'll be mailing it tomorrow morning. Thanks for the chance to win it's really a good cause for it. when i first came to this website.. i was like.. what is this junk all over the website?!!? a contest? i joined soo many and well, i never won..
soo sad.. luck is never in my way. OK WOW, I am loving your card designs. The side var is really nice. Very well done! wonderful sentiments, it is more than stamping the power of what a card can do to someone's day.